Since this was taking place on a Friday night, after a long day of working, I wanted to make sure the menu was easy and that most could get done way before hand and the basically reheat once I got home from work. I decided to go with my trusty Beer Stew (for those meat eaters), served with mashed potatoes, a Lentil Salad (which I will post soon) and as a starter I decided to serve these Poppy Seed Tartlets from the Savory Baking book which I rave about when I made the Onion, Fennel and Orange Upside-Down Shortcake. Folks, this is another winner. The recipe is a bit labor intensive, since it a 3 parts recipe. But, you can make each of them days apart and the put together on the day you will be serving them - Which took me about 1 hour from making the dough, to baking them and filling them in order to serve as the appetizer of the meal. And voila! A great looking starter, perfect for an intimate dinner party. And one that will sure bring tons and tons of praises. Preheat oven to 350F. Put four 4-inch tartlet pans on baking sheet. 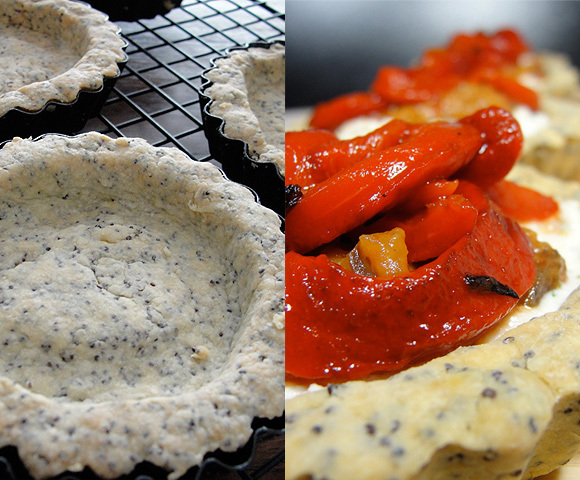 Combine the poppy seeds, flour and salt in a food processor and pulse 2-3 times until incorporated. Add the butter and pulse again until resembles coarse bread crumbs. Stir in the egg and cold water, pulse again until incorporated, test the dough by pressing with your fingers, it should come together. Put the dough onto a lightly floured work surface, kneed it a couple of times, then form it into a flat disc. (note: you can store the dough at this point, by wrapping it in plastic film. Refrigerate for up to 3 days or freeze for up to 1 month). Divide the dough into 2 pieces. Roll one piece of dough out with a rolling pin to about ¼ inch thick. Cut the dough to fit 2 of the tartlet pans. Gently press the dough into each pan and trim the pastry flush with the pans to crate a neat appearance. Roll the other half of the dough and line the remaining tartlet pans. Place the baking sheet into the oven and bake until light brown, 12 to 15 minutes. Put the tartlets on a cooling rack and let cool before removing the baked crust form each pan. Put each tartlet shell on an individual serving plate. Spoon 2 to 3 tablespoons of the ricotta filling into the center of each shell. Top with 1/3 cup of chili-grilled Eggplant and Sweet Roasted Peppers, mounding it slightly. Garnish with the balsamic julienned roasted peppers. Serve the tartlets at room temperature or, if desired, carefully place them on a baking sheet for warming. Heat in a 350F oven for 10 minutes. Put all the ingredients into a small bowl and stir to combine well. Preheat the grill to medium. Slide the eggplant into ¼ - inch-thick slices and put the slices on a baking sheet. Stir the chili oil and the ¼ cup olive oil together into a small bowl. Lighting brush both sides of the eggplant slices with the oil mixture and dust with a little ground cumin and salk. Heat the grill. Place the eggplant and peppers on the grill. Roast the eggplant until soft and well marked by the grill, about 2 minutes on each side. Remove from the grill to cool. Roast the peppers until black on all sides, 10 to 12 minutes. Remove from the grill and let cool. Peel the black skin off the peppers and the stem, derib, and take out the seeds. Put the eggplant slices, the remaining 2 tablespoon olive oil, half of each of the roasted peppers, garlic, and a little salt in the bowl of a food processor. Pulse until chunky, about 5 to 10 seconds. Remove from the bowl and season with more salt, if needed. Cut the remaining roasted peppers into julienne strips and toss with the balsamic vinegar. Garnish the eggplant mixture with the julienned balsamic peppers. *purchased jarred or canned roasted red and yellow peppers can be used to save time.